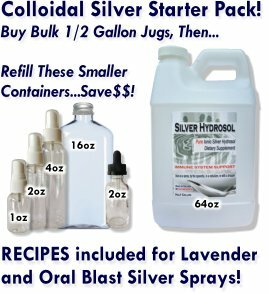 Colloidal Silver Starter Packs - Sprayers, Flasks, and Droppers + Savings of 25%! 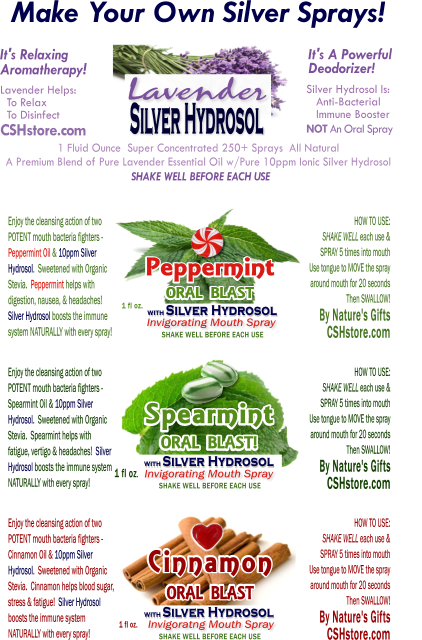 Starter Packs - Bulk Jugs of Silver Hydrosol + Sprayers, Flask and Dropper in One Convenient Purchase! Several months ago, we realigned our business model to simplify our offerings while still providing our customer friends the ability to enjoy all the same products. We did this by teaching our customers to make our Lavender and Oral Blast Sprays and providing the empty bottling at a nominal cost, and to use over and over again, refilling from our half gallon jugs. The results have been excellent! We've been able to avoid big increases in overhead by not investing in bottling equipment for sprays. Visit our homepage at www.CSHstore.com to order!